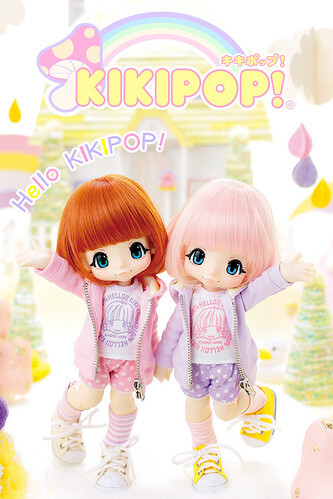 These days, it’s not every often that I get excited about something other than a Pullip but the new line of Kikipop dolls has definitely grabbed my attention! Kinokojuice has partnered with Azone to release a series of fashion dolls based upon the design of her very sought after and hard to find bjd dolls. When originally announced they were limited and exclusive to Azone’s physical stores in Japan. Luckily a general commercial wave was announced shortly thereafter some time between June and the more vague fall (depending on which website you look at Amiami says one thing, HLJ says another). The benefit of having ordered from Azone is that you will get your dolls in April so you will have your dolls earlier than everyone else. 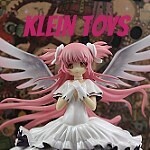 The dolls are priced at 24000 yen (approximately $204 USD as of this writing). I think I just died from cuteness overload! I had been aware of the bjds from Kinokojuice for quite some time but they start off quite expensive coupled with the fact that they are extremely limited and are very popular made their price skyrocket. They were so absurdly adorable but so out of price range, I and probably a lot of other people in the doll community are very happy that there is now a much more budget friendly way to get a doll by Kinokojuice. The Kikipops are roughly the same height as the original Kinikojuice bjds so 23 cm or slightly under 9 inches tall. They are a bit “chubbier” than most other fashion dolls but they should still be able to share clothing with other dolls, this photo shows her in an Angelic Pretty outfit set designed for Pullip/Dal. Normally Azone dolls have eyes that are decals/painted on, the Kikipop’s eyes are in-set glass eyes which means in theory at least you may be able to change them. They also seem to have wigs which is also unusual for Azone dolls as normally they have rooted hair instead. I think it’s pretty cool that you may be able to change their wigs/eyes so you can really make them your own. Marmalade Brown has reddish brown hair and blue-green hairs. She comes with a pink hoodie, a white t-shirt, pink with white polka dot pumpkin shorts, purple and white striped socks and sneakers. Honey Pink has light pink hair and blue eyes. She comes with a lavender hoodie, a white t-shirt, purple with white polka-dots pumpkin shorts, pink and white striped sock and yellow sneakers. Verdict: After I found out preorders were open on HLJ, I hurriedly went to the site and tried to make a decision between Marmalade Brown and Honey Pink. I was very torn on the decision but I eventually ended up choosing Honey Pink over Marmalade Brown. Then about an hour later I started thinking about it again and how much I like redheads I went back and ordered Marmalade Brown as well ^^; . I definitely didn’t want to risk missing out on these as I know I would regret it, trying to get them off of the secondhand market later on would probably end up being a nightmare. This entry was posted in Doll and tagged azone, honey pink, kikipop, kinokojuice, marmalade brown. Bookmark the permalink.